Will New FDA Guidelines Allow Pharma to Join In? 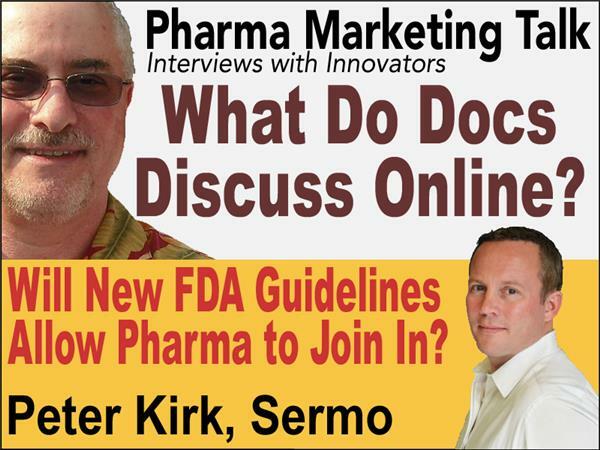 Pharmaguy interviews Peter Kirk, CEO & Sermo, who talks about the nature and value of physician discussions on Sermo and how pharma can engage docs on social media sites and online discussion boards. Tell us a bit about Sermo and the physician members. Are physician members engaged in meaningful discussions on Sermo? What are they discussing? Jeff Tangney, CEO of Doximity, said most online physician discussions were mundane and not related to medical practice. In the past Sermo has worked with pharma companies such as Pfizer to bring them into these discussions (see here). How did that work? Was it successful? What kinds of discussions do physicians on Sermo want to have with pharma? In your opinion, what impact will the recent FDA guidelines have on how the pharmaceutical industry engages physicians on social media sites and discussion boards such as Sermo. What value can pharma marketers gain from engaging in physician discussions via social media? What values can physicians gain?